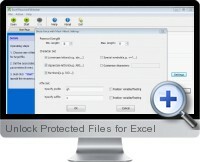 Unlock Protected Files for Excel is designed with powerful options to recovery the protection password for all versions of Excel files in order to open them. Unlock Protected Files for Excel is fast and simple to use and intelligently uses computer processing power to optimize the password recovery time. Three attack models are available to recover protected Excel file passwords. Brute force attack tries all possible combination if nothing is known about the password. If some symbols or length of the password is known, a brute force with mask attack is can save the Excel password recovery time by restricting the search area. Dictionary attack allows to recover an Excel password according to default dictionary of the program, or a custom dictionary can be added to the program in order to shorten the recovery time. Compatibility and fast performance support all versions of Excel. Program priority can be set for better performance. Works well with Multi-core CPU processors to speed up the recovery. Pause and save the recovery and resume at a later time. Option to shut down the computer automatically when the recovery is finished. Support for NVIDIA GPU acceleration which can increase the Excel password recovery speed. Professional, timely and free technical support always available.